Zero to ten. A shut out defeat. Carver’s high school girls soccer game ended before the full 90 minutes was even up due to the mercy rule. As the new community coach for the girls and boys 2017-18 season at Carver Early College, I knew I had my work cut out for me. Prior to the season, Principal Thornton relayed the state of the teams to me: “The coach tells me when the girls get off the bus and see that the other soccer team is white, they say they have already lost. Help me change that.” I had not forgotten my promise to help turn that attitude around. 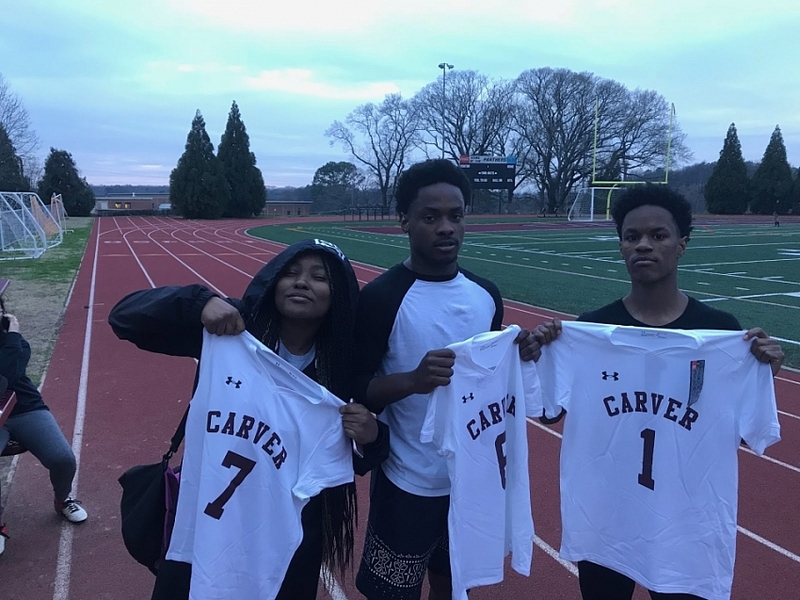 Carver boys and girls soccer players showing off their new uniforms. On the way to practice the day after the shutout game, I dreaded what kind of shape I would find the squad in. Morale is such a huge part of any successful program, and I wasn’t sure how they would take the loss the night before. What if only half the team showed up for practice? How would I get the other half to commit to a productive session? I nervously imagined either angry or sad faces on them all. I knew it was a score they were used to seeing, but we had done so much work leading up to our first games, it felt extra tough. On top of it all, I was running late for practice. When I arrived, the team was already putting in work. “I’m open!” another player screamed. Those weren’t the sounds of a team that had surrendered. Feeling like I had been saved by the bell, I jumped right into practice. After a couple of strong tackles, I knew this team had grit! Many people confuse grit with a determination to win, but grit is the determination to fight. It means that even if you’re bound to lose the game, you’ll take the pound of flesh owed for beating you. Community Coach Phinizy with the Carver boys before their 7v7 game in an SOPFC league. “Loooosers, looooosers!” screamed a Carver student from the gate bordering the field. And just like that my mood shifted again. How could this be? How could the Carver players represent their school and take that beating, only to be picked on by their fellow students? What’s worse, no one told the kid taunting them to stop. It’s as if it was just the norm for them. In the haze of that emotional confluence, it hit me: these kids needed a win! Aside from the camaraderie of being on the team, it seemed as if the players were frustrated by their soccer experiences. Isolated from the rest of the soccer community, their only interaction with other soccer players was getting beaten (badly), then picked on by members of their own school for losing. Despite their record, I knew from that one practice that this team was full of champions in the making--but still, we needed a morale boost, bigtime. 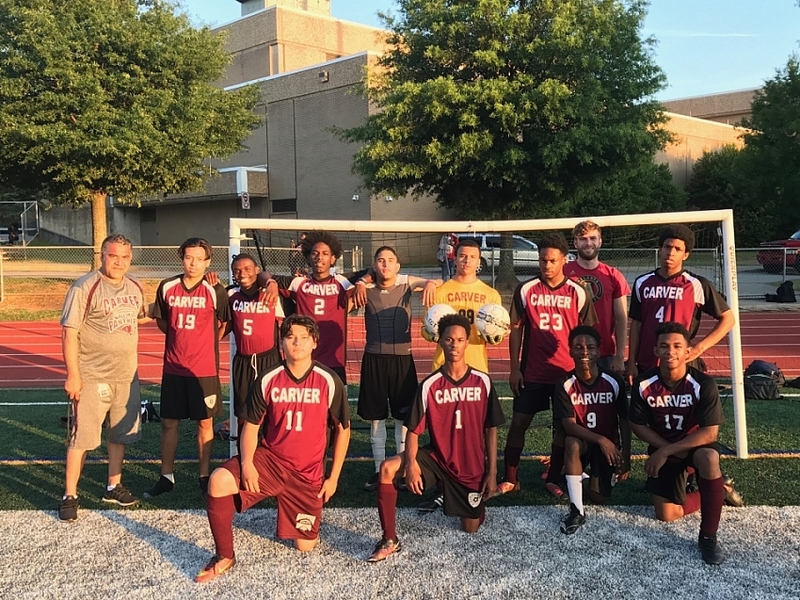 Building a soccer program at Carver that could take on a high school program like Decatur’s or North Atlanta’s, as we had promised, would take years. We needed something now. What could we offer that was exciting, fun, and soccer-related? Of course! What better than a game at the Benz with some rowdy ATL UTD fans! Carver players learning ATL UTD chants. 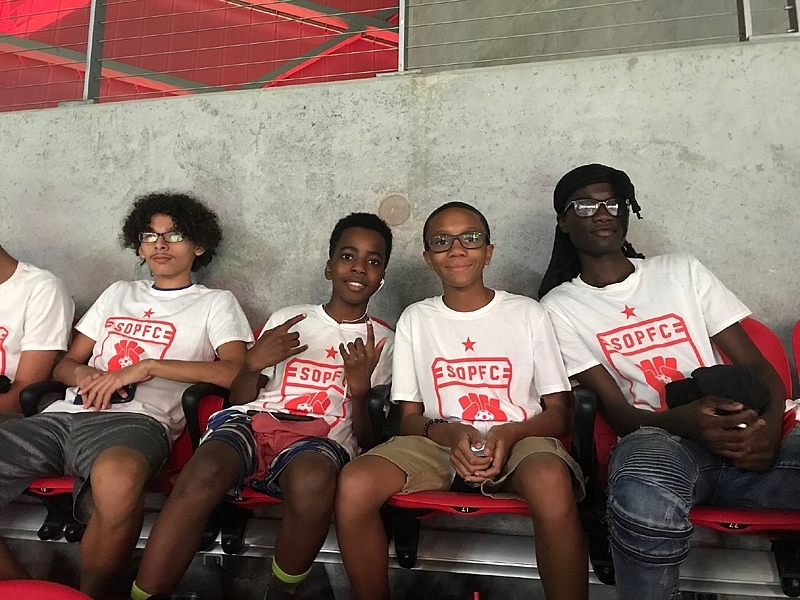 Together with our friends at Soccer in the Streets, SOPFC coordinated the Fall 2018 Champion the Youth Adult Soccer Tournament to raise the funds needed to take not only Carver players, but the soccer players at all of the high schools SOPFC partners with to an ATL UTD game! 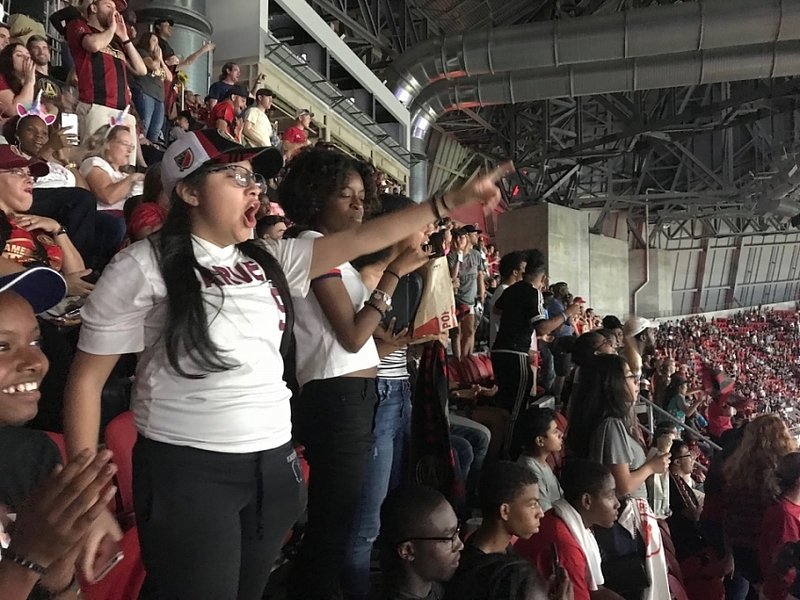 In total, we needed over 100 tickets, food, and buses to take the boys and girls of Carver, Maynard Jackson, and Washington High Schools to a United game at Mercedes-Benz Stadium. For 90% of the kids, this would be their first time ever seeing a professional game. The tournament was a success, raising the funds necessary to take the kids at all three high schools on a field trip to see ATL UTD take on Real Salt Lake on September 22nd. 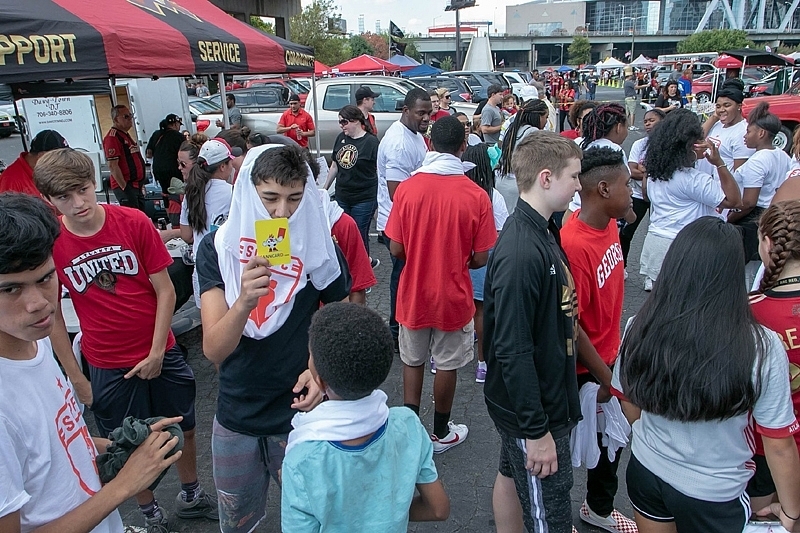 It was an incredible feeling that not only were ATL UTD fans responsible for creating the stadium atmosphere we wanted to share with the kids, but they helped get the kids to the Benz in the first place. And the student-athletes came away with an unforgettable experience rooting for their home team, learning ATL UTD chants, bonding as teammates, and meeting soccer players at other Atlanta Public Schools. "Going on the trip to the Atlanta United game with my teammates and the schools was pretty fun, we got to bond more as a group and build chemistry. It was also a good experience for those who have never been to see a professional soccer game before, so by us going it showed us how the game is played at the next level." Special thanks to APS Department of Athletics for their ongoing partnership; Atlanta United FC for the tickets; and Terminus Legion, The Faction, and Majestic Soccer Club for participating in the fundraiser tournament and providing a fun and safe space for everyone to hang out before the ATL UTD game. View the full photo album from the field trip on Facebook. If you're interested in becoming a paid community coach at one of our partner high schools, view our jobs page.